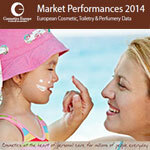 Figures released at the Cosmetics Europe General Assembly show that the European cosmetics and personal care market has remained resilient in 2014 in a tough economic climate and is showing signs of recovery. The positive news comes in the context of the second annual Cosmetics Europe Week, which took place in Brussels on 16-17 June. The European market is equivalent to 72.531 billion Euros total retail market size. The top 4 markets are Germany (13,012 bn Euros), France (10,583 bn Euros), UK (10,397 bn Euros), and Italy (9,392 bn Euros). The industry is showing signs of recovery with 0.5% growth in 2014 (+0.8% in 2012, -1.4% in 2013). Toiletries (+1.3%) and decorative cosmetics (+1.2%) had the strongest growth. Sales of skin cares and fragrances increased by 0.1% whilst hair cares decreased by 0.2%. The European export market is one third of the global market totalling 16.4 billion Euros. France remains leader (5.81 bn Euros), followed by Germany (2.86 bn Euros) and UK (1.41 bn Euros). The European cosmetics and personal care industry employed approximately 1,700,000 people with 140,000 direct employees and 1 570 000 indirect employees. 56% are women, 44% are men, including 25,000 scientists. Over the past five years, the industry has been able to grow direct and indirect employment by 2.3% or more than 39.000 workplaces.